One of the most important keys to success is to keep your dream alive. Most people have a dream, but the problem is that they slowly forget about their dreams as the days go by, and eventually, they quit and give up on them. Does this sound familiar? If you want to achieve your dreams, you must make them alive. You must hold them into your mind at any moment and keep them alive. The moment you forget about them is the moment your dreams start dying. The book, The 4 Disciplines of Execution, explains it clearly that most people fail to achieve their goals because they get bogged down with their day-to-day activities. People are on fire when they first set their goals and started the journey to achieve their dreams. However, things started to slow down when they have to deal with their daily urgent tasks. They take actions, but the result did not come immediately. After a few weeks or even days, people start to lose hope and somehow, they slowly abandon their dreams and eventually, totally let go on what they desire to accomplish. This is why it is extremely important to keep your dreams alive. If you don’t, your daily work tasks and other urgent matters will slowly devour your dreams and goals. You will forget about your dreams and not acting on them. You will lose momentum and give up on your dreams. 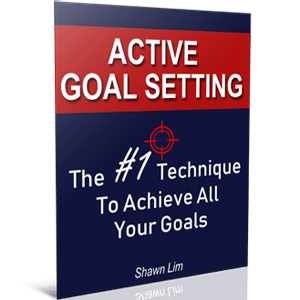 Daily goal setting is one of the most powerful techniques to keeping your dreams alive. When you write down your goals, you are reminding yourself about your targets and you program what you want to accomplish into your subconscious mind. Successful people like Brian Tracy and Scott Adams write down their desire and what they want to achieve each day. Scott Adams says that he wrote down, “I, Scott Adams, will become a syndicated cartoonist.” 15 times a day. He is a strong believer in affirmation and repetition. When you keep telling yourself something over and over again, it will eventually become real to you. Writing down your goals and dreams is an easy act, but it requires some commitment, especially when you want to do it daily. My suggestion is that since this is a free technique, you might just put in your commitment and practice doing it every day. Another powerful way to keep your dreams alive is to talk about them with other like-minded people. When you mix with business people, you will talk about business and economy. When you mix with teachers, you will talk about the curriculum and which students are doing good or bad. When you mix with negative people, you will talk about other people and complain how unfair are your current situations. You will become who you mix with most of the time. So if you want to keep your dreams alive, talk with other people who shared similar dreams with you. If you are in property sales, go and mix with other successful property agents and your conversation will be on this topic. So keep your dreams alive by talking and sharing them with the right people. Do you review your goals and the results you get at the end of each day or week? If you don’t, you should. You must measure your result in order to know where do you stand right now. More importantly, you want to know if what you are doing is working. If you are getting the result, it simply means that you are on the right path and you should keep doing it. If you don’t, you should change your plan and strategy. This is why you must review and measure your dreams and goals. Furthermore, when you measure your result, you are actively working on your dreams. You will know where you are and what you should do to achieve what you want. Most people will just write down their dreams and goals, but they never really do anything to measure and review them. When you stop measuring your dreams and goals, you will start to forget about them. Sometimes you may be busy and there are just too many urgent matters require your attention. In this situation, you will tend to let go of your goals for a day or two, and my advice to you is, don’t! The key is to maintain your momentum and you want to develop the habit of acting on your dreams. When you stop doing it or taking action, you will start losing your focus and momentum. So what you should do is to put in the minimal effort. For example, if you want to lose weight and you plan to hit the gym for an hour each day, when you are busy, just shorten your workout session. Instead of spending an hour in the gym, you can spend just 15 minutes. You want to maintain the momentum and keep the habit alive. Thus, don’t break the process. You can put in less effort to maintain the habit, but don’t ditch it totally. When you don’t have the time or when you are too busy, put in the minimal effort. Instead of writing 1,000 words article, go for just 300 words. You have to keep the momentum going. Most people lose their motivation and drive after some time down the road because they totally let go and do nothing to keep their dreams alive. Don’t let this happen to you. Commit to taking just the minimal effort to maintain your drive. It is the habit that counts. Another great way how to keep your dreams alive is through reading and constant improving yourself. When you learn something, you will feel inspire and you will feel motivated again. Whenever I read an article about how people are having a breakthrough with their blogs and websites, I’m feeling inspired because I tell myself if they can do it, so can I. The success stories tell me that it is possible for me to achieve extraordinary results too. This is why reading is such an important habit that I strongly suggest you adopt. You can read this article that I have published before to learn more: Why Do You Need To Read Books And The Benefits Of It. Look at all the successful athletes out there, they train every day, right? They know that the moment they stop improving, they will start dying. It is either you are moving forward, or you are moving backward, there is no such thing as staying the same. When you stop taking action and staying stagnant, you will become obsolete. Do you know that if clean drinking water remains stagnant for years, it will become poisonous water? You have to keep improving yourself if you want to maintain your momentum. To keep your dream alive, you must not compare yourself with others. Most people want to achieve an outstanding result like other successful people did. And what they do is that they try to compare their results with other people. When they see other people are driving a Mercedes or a BMW, they wanted one too. And if they can’t get it, they will doubt themselves or justify why they fail to achieve it. They will blame and give excuses by saying things like “I’m just not that lucky”, or “he must be getting money from his parents and family”, or “If only I can speak fluently, I can be successful too”. The problem with giving excuses is that you will eventually buy into those excuses. The more you do it, the more they will become your habit. And when giving excuses and blaming become your habit, you will live them as a reality. You will never be successful that way. Unless you can turn the competition into positive energy, don’t try to compare yourself with others. You are who you are and you don’t have to compare who is earning more money or who is more successful. Just be yourself, believe in yourself and take the necessary action to get what you want in life. There are just too many distractions and too many things to do nowadays. People want to watch TV, they want to play games and they want to spend time on social media too. You have to cut down distractions to keep your dreams alive. When you get distracted, you will tend to forget about your dreams. This is not what you want. There is an opportunity cost in everything that you choose to do. When you choose to watch TV, you miss out the opportunity to work on your dreams. When you choose to play games, you will miss the time to exercise in the gym. All of us have only 24 hours a day. It is not about how you manage your time, it is about how you manage yourself and your decision. Thus, learn to cut down distractions and spend less time on things that don’t really matter. Focus on your priority and do what you are supposed to do. Unsuccessful people spend time enjoying life and worrying about their future later. Successful people spend time to work hard on their dreams and they choose to enjoy later. So which category do you fit in? Always choose to get rid of the distractions and focus on what you want to accomplish in your life. One of the easiest ways to make sure that you remember your dreams and goals is through affirmations and visualization. In fact, studies have proved that affirmations and visualization works. In sports, you will see professional athletes use pep-talk to drive each other’s mood into higher energy to win the game. This is the same as affirmations. As for visualization, the Law of Attraction describes it all. You become who you think about most of the time. So imagine the life you want and the results you want to achieve in your life. Practice both visualization and affirmations to remind yourself of your dreams. More importantly, these techniques allow your dreams to better absorb by your subconscious mind. Each morning before I start my work, I will practice affirmations and I will also write down my goals. As for visualization, whenever I’m free, I will sit down and imagine all the things that I wanted to accomplish in the future. You can and you should do the same. Of course, you don’t have to follow my footsteps on how I do it. However, these techniques are back with studies that they work. And they are free to apply anyway, so you might as well practice them in your journey to success. Never let anyone stop you from achieving what you want in life. You have to protect your dreams. If you are serious and committed, you will do whatever it takes and you will never care how other people think or say about your dreams. Sometimes even people who are closest to you will talk you out of your dreams. They will tell you to get ‘real’ or to get a ‘job’, and achieving what you want is impossible. Don’t give up and keep marching forward. Do understand that people who talk you out of your dreams may not necessarily understand your desire. They may not be bad, but they just don’t understand how things work. I faced the same situation whenever I talk about my dreams and the future I want with my parents. They will think that I’m getting scam whenever I buy courses online. They thought that it is impossible to work from home with the internet. My friend, please understand that this is a very common situation and everyone who has a dream and dares to chase it may face a similar situation. However, you must not deter. You must choose to press on and work hard despite the adversities and challenges you face. Tough times are there to build your characters. And don’t give up. Protect your dreams and don’t let other people talk you out of your dreams. Finally, in order to keep your dreams alive, you must believe in them and in yourself. If you don’t believe in your dream, you will never do anything to achieve it. If you don’t believe in yourself, you will never bother to take action. No, when you don’t believe in something, you will never do it. Even if you do it, you will do it poorly with a half-hearted effort. Why do you think Elon Musk puts in so much effort into building rockets? If he doesn’t believe in his dreams and himself, do you still think that he would pour in so much effort and hard work? Not likely. Successful people believe in their dreams. They believe in themselves that they can achieve what they want too. This is why they are willing to go the extra mile. This is why they are willing to sacrifice, wake up early and stay later just to put in more effort to get more and better result. Keeping your dreams alive is vital. When your dreams die, you will fail and you will give up. Extraordinary people understand that to keep their dreams alive, they must turn their dreams into part of their habits. And if you follow these 10 tips here, you will be able to keep your momentum going. You will be able to maintain your drive and transform your dreams into your habits. So do it every day. Be consistent and take action each day. Make sure you do something every day to reach your dreams. Success is about taking one step at a time. Remember, nobody makes it to the top of the mountain with one jump. It is the small little steps and effort that accumulate and get you the extraordinary result you want.